River North Correctional Center is a level 4 prison located in Independence Virginia. The prison opened in 2013 and is one of the newest facilities in Virginia. It has a maximum capacity of around 1,000 adult male inmates. 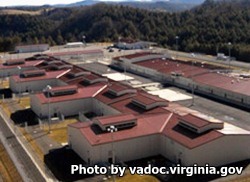 It is one of the most technologically advanced prisons in Virginia, and is extremely energy efficient. Offenders at River North Correctional Center can work various jobs within the institution providing vital services to the facility including food preparation, custodial work, and laundry services. Inmates are provided necessary medical, dental and mental health services during their incarceration, and can participate in various vocational training. Visitation at North Correctional Center is on a rotating schedule, contact the institution for the current visiting schedule.